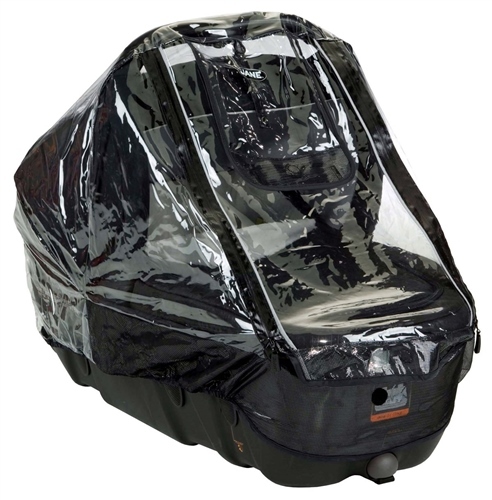 This raincover is specially designed for the Jane Transporter carrycot, however, as it has also been designed to be a universal raincover, it will also be suitable for most carrycots which already have a fabric hood to support it. The design of this raincover has no frame which in turn allows it to be easily folded, compactly away. Jane's range of practical raincovers will keep your little one protected and comfortable while you're on the move. These exclusively designed raincovers help to protect against the wind, rain, and also aids air circulation and prevents temperature build-up with the mesh and exclusively designed roll up window. An exclusive 'Roll up window'. Universal style suitable for most carrycots. Universal type raincover, but has been specially designed for the Jane Transporter range of carrycots. Jane Transporter, Transporter 2, Micro and most other carrycots. The rain cover for the Transporter fits like a glove. Spot on! Will this fix the I matrix 2? Jane UK Replies: Hi Nic, the raincover for the Matrix 2 would be the one called : Universal G0 & Carrycot Type the number 6546 into the search on our sight and it will be shown. That model is best because it fits car sea5 and carrycot. And Matrix is both. Hope this helps.